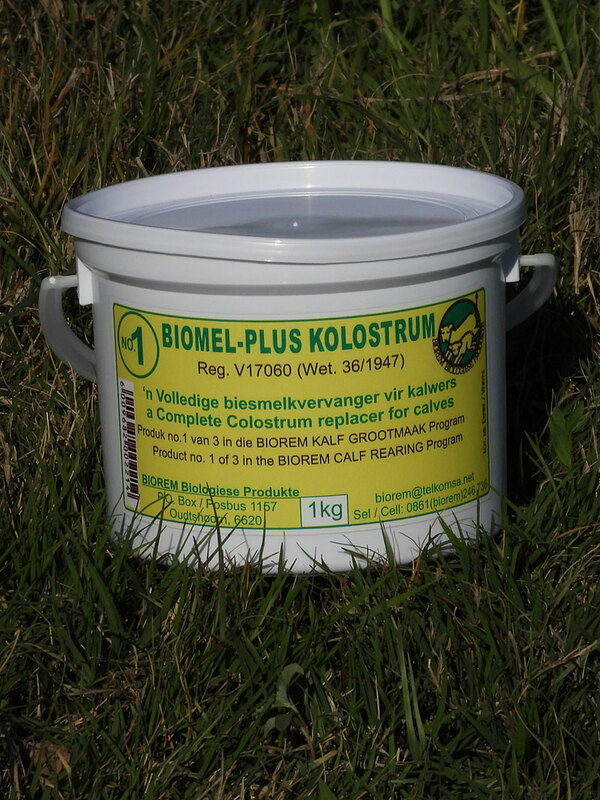 A complete colostrum feeding for calves to increase passive immunity of new born calves if they did not receive any colostrum, or when colostrum was of a bad quality or insufficient quantity. To be administered within 6 hours after birth. A complete food supplement for animals, younger than 7 days of age, to give support during stress situations, especially when the change from colostrum to milk causes digestive problems. Mix 100 gram BIOMEL PLUS COLOSTRUM with 1 litre luke-warm water (average 45°C) and dose the calf immediately. Repeat on the hour if treatment follows within 6 hours after birth, for 6 hours. Older calves, not older than 7 days, dose immediately and repeat every 6 hours for 1 to 2 days as necessary. All of the product that has been made up should be used immediately, or be refrigerated for a maximum period of 10 days. Prevent contamination by pouring out the correct volume and seal the container immediately. Preheat to body temperature before administrating by putting the container with the measured volume into warm water. Product that has been made up, should be stored at 4°C for not longer than 10 days.